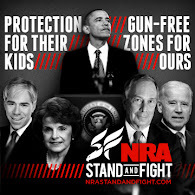 The NRA-PVF has released their first ad of this presidential election cycle. The ad is not so much pro-Trump as it is anti-Hillary. I've watched the ad a few times and every time I'm struck by how powerful a message it sends. It features Mark "Oz" Geist who is a retired US Marine and is the security contractor who led the mission in Benghazi. He is the co-author of 13 Hours: The Inside Account of What Really Happened In Benghazi. With the Rep. Trey Gowdy's House Select Committee on Benghazi releasing their report damning both the White House and State Department, it is very timely. Watch it and share this with your friends. UPDATE: I just saw the NRA ad featured in a story regarding Donald Trump on CNN this morning around 9:30am EDT. They didn't run the whole ad but enough to get the gist of it. According to CNN, the NRA-PVF is spending $2 million on air time.